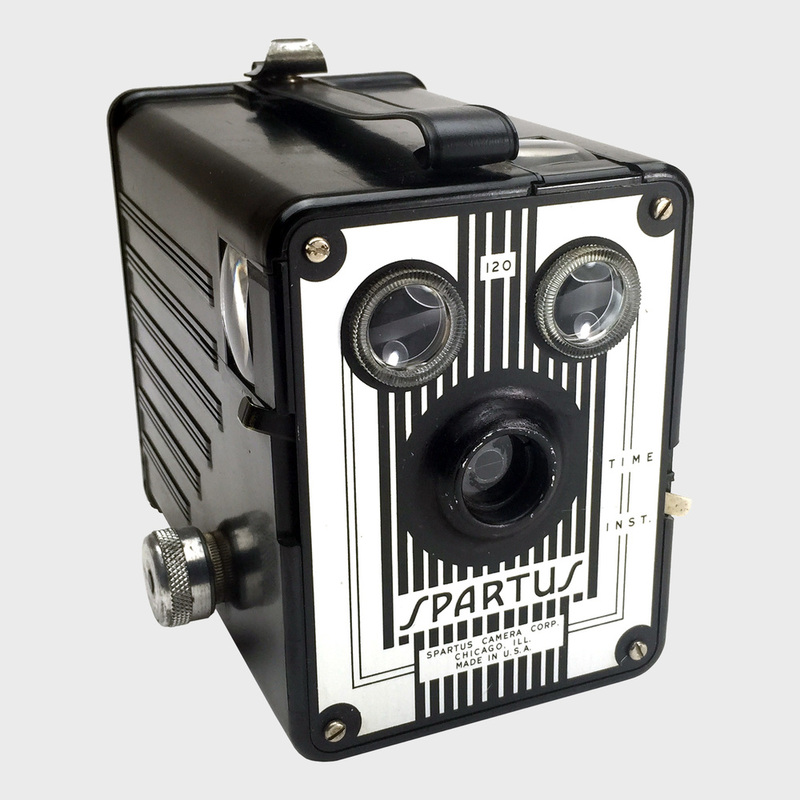 The Medium Format Box Camera Company - Spartus 120 "Deco"
The Spartus Camera Corp. was one of many tangled entities in Chicago, IL during the mid-20th century making inexpensive, user-friendly cameras targeted at the amateur market. The Spartus 120 has been seen with at least two faceplates - we call this one "Deco." Both versions seem to be exactly the same otherwise. The camera pictured at right has been tested by MFBOXCO, and we report that although it racks up only a mid-range score, it is extremely lightweight, responsive and really easy to maintain and use. We really love this camera and would recommend it to anyone who wants a simple box. The four screws on the front are easily removed, allowing you access to the viewfinders and lenses for easy cleaning. The all-bakelite construction is roughly half the weight of similar cameras, and a quarter of the all-metal Zeiss Ikon Box Tengor. The winder has a strong spring and the removable film holder keeps film relatively tight, although due to its placement, you turn the crank "backwards" to wind the film, which is mildly awkward. Beyond a Time mode, there are no other features to speak of - just a very simple, very easy to maintain, and not-so-bad looking box. A note about bakelite. While very lightweight, bakelite is notoriously more brittle than normal plastics and thus when looking to purchase a bakelite camera that you will be using, make sure to check carefully for cracks, splits, missing chunks, chips or crushed spots. These are all places for potential light leaks. Very usable and lightweight camera that is also light on features.